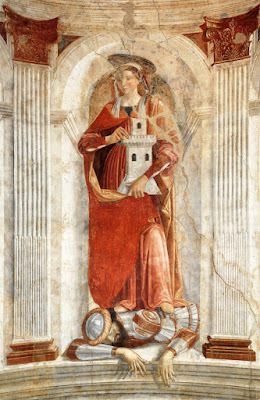 On the calendar of the Extraordinary Form, today is the feast of St Barbara, who was in the later Middle Ages one of the most popular among the Virgin Martyrs. 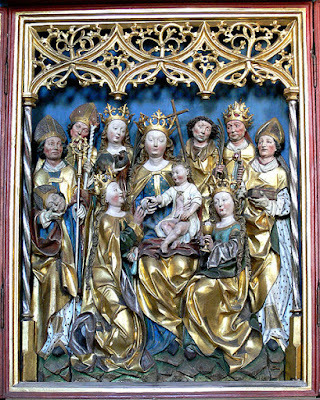 Fr Hunwicke’s clever description of St Nicholas might also be applied to her: “a saint with as large a portfolio of Patronages as a Renaissance cardinal.” She is one of the Fourteen Holy Helpers, invoked against lightning and fire, and patroness of gunners and military engineers, anything to do with mining and tunneling, and furthermore of architects, builders and masons, as well as mathematicians. 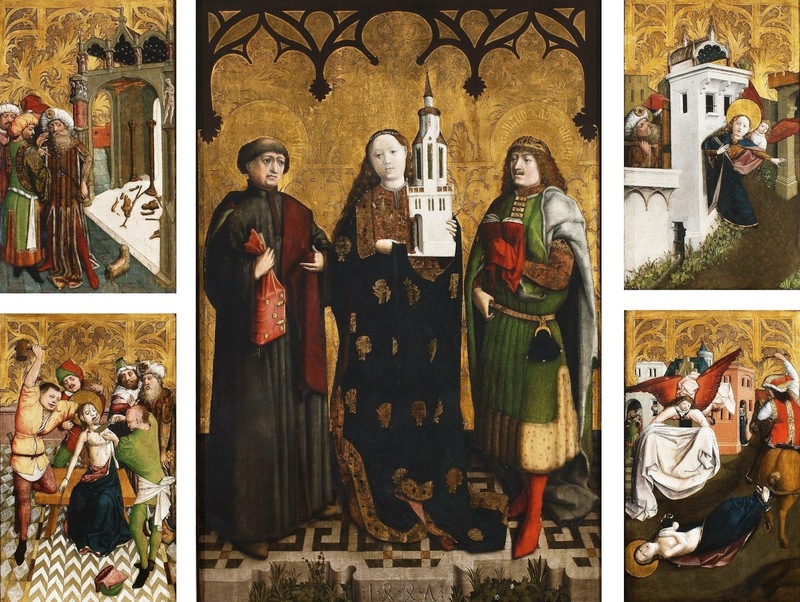 Medieval Christians wisely dreaded the idea of dying suddenly and without the benefit of the Sacraments, and much of her popularity was owed also to her role as patroness of a holy and prepared death, a role which later passed to St Joseph. 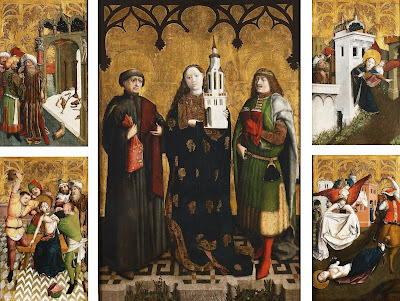 The basic outline of her story is fairly consistent in its various versions, although the specific manner of its telling is hardly the same in any two Breviaries. Barbara’s father was a wealthy pagan named Dioscorus, who, before going on a long trip, had her enclosed in a tower to hide her extraordinary beauty from the eyes of strangers. Contemplating the splendor and harmony of the world, which she could observe from the tower’s two windows, she began to think about its Cause. In her longing to know the truth about the Creator, she determined to seek the knowledge of Him as the only good in this world, and thus made a vow of virginity. The pre-Tridentine Roman Breviary states that she received a vision in which the Incarnation and Passion of Christ were revealed to her first by angels, and then by Jesus Himself, but this seems to be a minority tradition. Renouncing the idols worshipped by her father, she became a Christian, and so had her father’s workmen open a third window in her tower, in honor of the Holy Trinity; hence her role as a patron of architecture and associated trades, and of mathematicians. Dioscorus, learning upon his return of his daughter’s conversion and refusal to marry, flew into a rage, and attempted to strike her with a sword. In one version of the story, Barbara fled from her father, and as she ran up a hill, was temporarily hidden from him in a cave which miraculously opened on it, whence her patronage of miners. There follow various accounts of the torments to which she was then subjected, her trial before a judge, and her eventual beheading by her own father’s hand. As Dioscorus walked away from the site of the execution, “fire fallen from heaven, by the just vengeance of God, so consumed (him) that there remained of him not even a tiny bit of dust.” From this last detail comes St Barbara’s role as protectress against lightning and thunder, and her patronage of military gunners, etc. 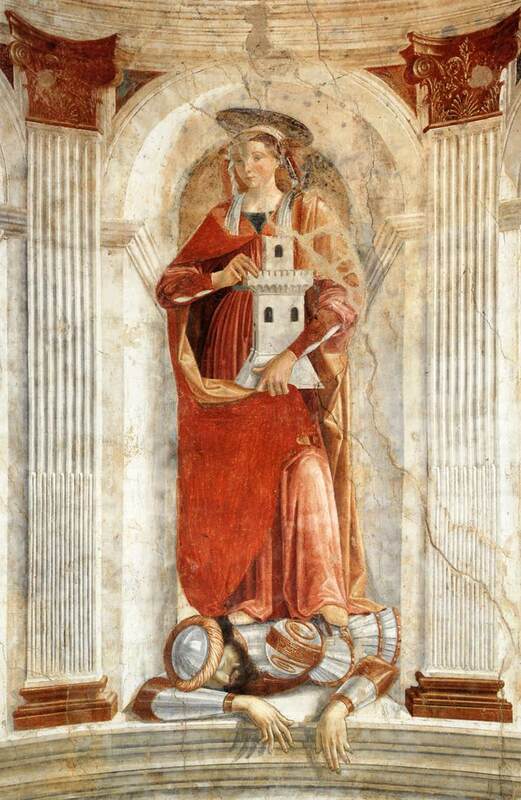 St Barbara crushing her father, by Domenico Ghirlandaio, ca 1471, from the parish church of St Andrew in Cercina, Italy. The words “according to the grace of Thy promise” refer to the tradition that during their passion, each of these Saints received a promise from God that their intercession would be exceptionally effective on behalf of those who honored them. 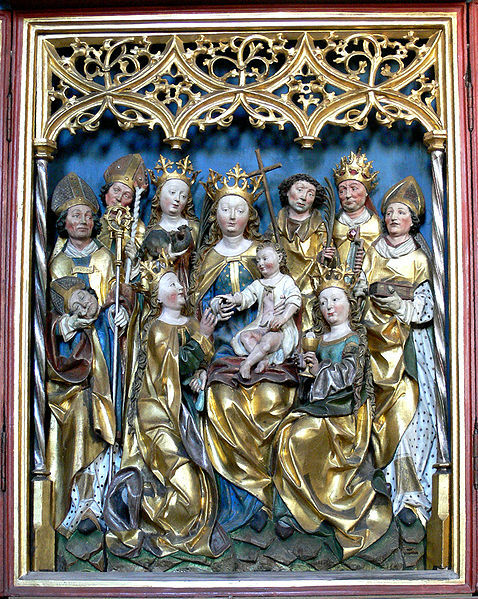 The alterpiece of the Fourteen Holy Helpers, from the now-suppressed Heilbronn Abbey in the Baden-Württemberg region of Germany, 1498. Scholars of hagiography have long recognized that the legend of St Barbara as passed down to us cannot be considered historically reliable. The version read in the Roman Breviary before the Tridentine reform says that she was born in the time of the persecutor Maximian, who reigned from 286-310, but makes her a student of “the most wise priest, Origen, who lived in Alexandria”, and who died over 30 years before Maximian’s accession to the imperial throne. It also transplants her native city of Nicomedia from its actual location near Constantinople to Egypt, identifies it with Heliopolis, and claims that it was the city to which the Holy Family fled from King Herod; other versions place her passion in Rome, somewhere in Tuscany, or Antioch in Syria. In the Breviary of St Pius V, her feast was reduced from an office of nine readings to a commemoration; it is also significant that in the Tridentine Rituale Romanum, promulgated by Pope Paul V in 1614, her name is not included in the shortened form of the Litany of the Saints said for the dying.